Periodic Chart Harmony Favors the Octave Interval. In music, an octave (Latin: octavus: eighth) or perfect octave is the interval between one musical pitch and another with half or double its frequency. It is defined by ANSI as the unit of frequency level when the base of the logarithm is two. The octave relationship is a natural phenomenon that has been referred to as the “basic miracle of music”, the use of which is “common in most musical systems”. T-1 is the unison. T-2 is the 2:1 octave ratio. Other harmonies are for future blogs. So where is the periodic chart harmony of the octave? Here is a quote from blog #400. It is also about the periodic chart. The system begins with hydrogen-1. The next vertical element is Lithium-3. So, 3-1 = 2. This is the first coding number on the chart. Lithium is atomic number 3. Sodium is 11. By subtraction 11 – 3 = 8. Sodium has 8 more protons than lithium. Potassium has 19 protons. Sodium has 11. We see another 8 protons by subtraction. As, 19 – 11 = 8. Next, Rubidium has 37 protons. Potassium has 19. We have our 1st 18 proton difference: 37 – 19 = 18. Cesium is atomic number 55. Rubidium is atomic number 37. Thus, 55 -37 = 18. That is followed by a 32 proton number difference. Francium is atomic number 87. Cesium is 55. Thus, 87 – 55 is a 32 number difference. 8 x 4 = 32. Blogs on DSOworks.com are attempting to place our planet in harmony with the cosmos. 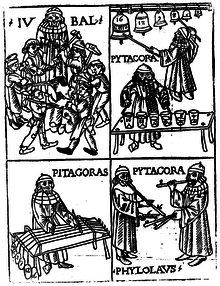 Pythagoras saw the basic unity of music with our world. He defined it by string lengths. If one string was 2 x as long as the other, the shorter sounded an octave higher to the longer. An octave is (1) The most harmonious interval. It is also the most “perfect” of the perfect intervals. (2) It is also the first overtone in the series of overtones. Why not take the musical view of our cosmos? For those who are interested, I’m offering piano lessons in Sarasota. Numerical Rhyme -is there Such a Thing in Physics?